In Llandudno time slips away, surrounded by the beauty of mountains behind and endless ocean beyond. Llandudno is a upmarket beach area, that’s known for its perfect beach flanked by giant boulders and the most exclusive Villas in Cape Town. Llandudno position is just the right balance between out of the way and close to the action. It makes for a perfect, restful and luxurious beach holiday, right in the middle of a highly sought-after beach area in Cape Town. 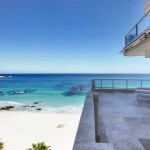 Llandudno can be found along the picturesque winding sea-side road from Camps Bay to Hout Bay. A pocket of elegant mansions leads down to one of Cape Town’s favourite beaches. The endless Atlantic Ocean stretches beyond, and each day the sun sets over the sea, creating memorable sunsets. Overlooking Llandudno are the majestic mountains, Judas Peak and Klein Leukoppie – seen from many Villas. Here you can revel in the luxuries of Self Catering Villas – create your own meals, dine al fresco and bask in the sun with your own swimming pool, taking in the breathtaking views. Nightlife is easy to enjoy from Llandudno. Hout Bay’s restaurants, Harbour Market and Harbour venues are just a five minute drive away. 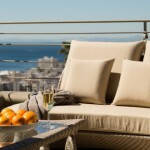 The Camps Bay Promenade with its world-class restaurants, cocktail bars and nightlife is ten minute’s drive away. As for beaches, Llandudno beach is great for families and couples alike. The giant boulders on either side are ideal for secret picnic spots, hide and seek or sundowners taking in the view. Hout Bay Beach, Camps Bay Beach and Clifton Beaches are all a short drive away. Llandudno architecture is refined, cutting edge and yet focusing on classic comfort than splashy design. Homeowners in Llandudno are the epitome of great taste, choosing design that doesn’t overstate itself – the setting is already impressive enough. That said, Llandudno Villas tastefully display wonderful combinations of wood, steel and glass, creations that are at once cool and classic, warm and creative. Villas go far to let the outside in, with large windows, impressive swimming pool decks and even design that incorporates the famous Llandudno White Boulders into the Villa. Llandudno Holiday Villas offer plenty of luxurious fittings and offerings. Many Villas offer swimming pools, jacuzzis, large entertainment areas, designer kitchens and bedrooms with impressive views. Llandudno is five minutes from Hout Bay, ten minutes drive from the restaurants and cocktails bars of Camps Bay, ten minutes from the wine route of Constantia, twenty minutes from Cape Town City Centre and the CTICC and twenty minutes drive from Table Mountain. 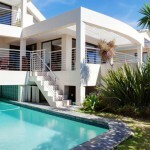 The airport is about a 30 to 40 minute drive from Cape Town International Airport.